In the now defunct Ding’s Garden is a new restaurant joining the mouth-numbing spice craze. Upon stepping into this new restaurant whose English name only shares the word “noodle” with its Chinese moniker, customers are greeted with a smiling of Chairman Mao and two other important looking Chinese men. 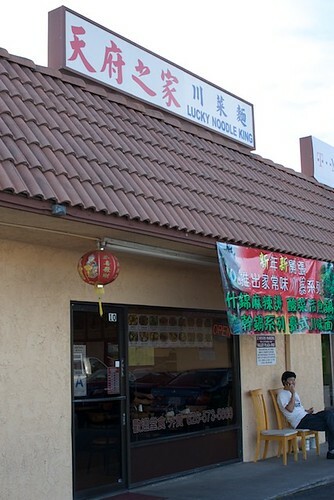 With a glance around at the photographs of menu items on the wall, it’s easy to see that Lucky Noodle King specializes in not just noodles, but also spice. Will, in his never-ending quest for dan dan mian ordered a bowl of that, extra spicy. According to him, the quality of Lucky Noodle King’s dan dan mian is almost on par with that of the highly esteemed No. 1 Noodle House. When I had a taste of it, I noticed a striking garlicky taste followed by the velvety richness of sesame paste and the stinging pain of the chili pepper paste. It’s not a bad way to go if you’re a fan of that dish. 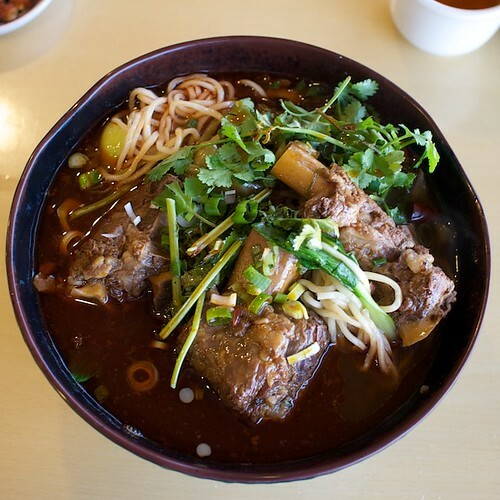 Considering the place has ‘noodle’ in its name, I also ordered a noodle dish: beef rib noodle soup. When the bowl came, I knew I was in for some pain. The slow-cooked beef was red, but nothing like the almost glowing red of the chili oil floating in a threatening layer on top of my broth. The beef itself was a little dry in spots, but still managed to fall off the bone with minimal prodding with a chopstick. The noodles were doing their terrifying job of sopping up some broth before entering the slick layer of chili oil as I fished them out of the bowl. It wasn’t until I was halfway done with the bowl and had consumed most of the chili oil thanks to those noodles that I was able to taste the actual broth. It was pleasantly salty but not that beefy. The lao ban niang claimed the broth was made in house. Will and I also ordered their seasonal green vegetable which happened to be A-cai, a type of Taiwanese lettuce, at the time. It was ordered mostly as a nice break from mouth-searing pain. 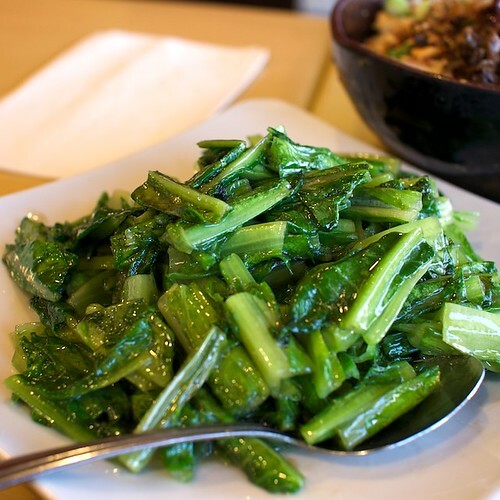 The vegetables were nice and crispy, a little oily, and almost a little too salty, but they did provide the much-needed breather. While I’ll miss Ding’s Garden and their comfort-food-tasting fishball noodle soup, it’s nice to have yet another place to go where I end up almost in tears with sweat dripping down my forehead and beading my nose. I’m already planning on what dishes to try when I go back. 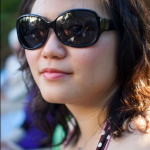 The mixed hot pot is definitely on my list if I can rope some more meat-eating friends into coming. 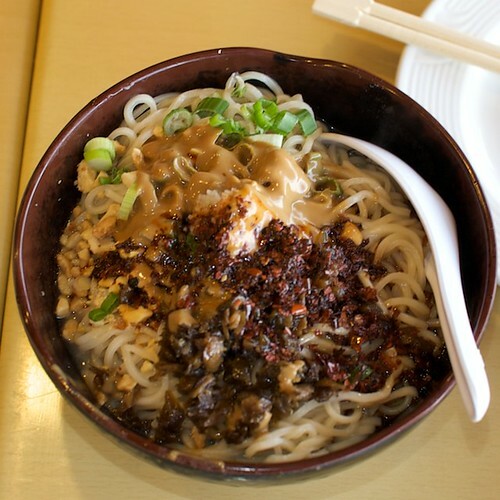 A fine-looking bowl of dan dan mian. This one somehow wasn’t quite as good as the one I had Thurs, but still pretty decent.